Do you have sensitive skin and are looking for an organic face wash? Face washes laden with chemicals can harm your skin in the long run and organic skincare is always the way to go if you have a sensitive skin and want to avoid breakouts. Organic face washes also give your skin a much-needed respite from all the chemicals used in the makeup products and other skincare products. These face washes clean the skin without clogging the pores or stripping away the natural oils. Available in two size options, this face wash from Era Organics is formulated for dry to normal skin. It can also be used as a body cleanser and contains Manuka honey and organic aloe vera that nourish and hydrate the skin. The pH-balanced formula is non-toxic and safe for people suffering from eczema and psoriasis also. It does not contain any parabens or sulphates. The fragrance of the formula is soothing and it rinses easily. The packaging of the face wash is convenient and handy. The quantity is good and the price is moderate as compared to other organic face washes. Organic aloe vera and Manuka honey repair damaged skin and removes excess oil and dirt. It can be used as a face cleanser as well as a body cleanser for all skin types. The formula has a soothing scent and a pH-balanced formula that does not irritate the skin. The face wash is free of parabens and sulphates that harm the skin. The price of the face wash is a bit higher since it is organic in nature. It does not work effectively on acne-prone skin that needs something stronger. This face wash works well for soothing skin inflammation and improving the condition of the skin in the long run. It has a very gentle formula that does not contain any chemicals that clog the pores and damage the skin. Made with rosehip seed oil, this facial cleanser comes in a convenient pump bottle and is suitable for all skin types. The cleanser works effectively as a makeup remover also and reduces sun damage. Other ingredients of the face wash include olive oil and sea kelp extracts that hydrate the skin and prevent further environmental damage. The formula has a lightweight gel-like consistency that glides very smoothly on the skin and is easy to rinse without leaving any residue. It is suitable for sensitive and dry skin. The price of the face wash is moderate. Rosehip seed oil clears acne spots and helps prevents dry spots. It has a very pleasing scent and the convenient pump packaging is easy to use. It removes eye makeup as well and has a very lightweight formula. The quantity is good as one bottle lasts for 3-4 months if used daily. The formula does not remove waterproof eye makeup easily. It can dry out the skin if used very frequently. The formula has a lightweight consistency and feels very gentle on the skin. The ingredients remove excess dirt and oil from the skin effectively and do not cause any further damage or breakouts. If you are looking for an affordable organic face wash, this facial cleansing gel from Acure Organics is a good option to consider. It comes in a handy tube packaging and has a brightening effect on the skin. The main ingredients of the face wash include pomegranate extracts, acai berry extracts, and blackberry extracts. The formula is creamy and feels luxurious on the skin. It has a faint citrus fragrance and leaves the skin feeling soft and moisturized. The price of the face wash is very affordable and the quantity is good as one tube lasts for a couple of months if used daily. The face wash comes at a very affordable price as compared to the quantity. The blackberry and pomegranate extracts brighten and lighten the skin tone. It has a rich and creamy consistency and lathers well. The soothing citrus fragrance does not irritate the skin. The formula can be a bit heavy for oily skin and can cause breakouts. It needs to be rinsed well in order to avoid clogged pores. It is a great face wash for travelling purposes as you get an organic face wash at a very affordable price and in a handy tube packaging. It contains natural extracts that brighten and nourish the skin while cleansing it. Made with 100% natural ingredients, the Desert Essence face wash is available in 4 sizes and comes in a pump bottle. It contains extracts of Hawaiian Awapuhi Ginger, chamomile, and goldenseal. Other ingredients include tea tree oil and Bladderwrack. The formula is soothing on the skin and reduces skin inflammation and itchiness. It is formulated without parabens and artificial fragrances. The face wash works well for oily to combination skin and lathers really well with a small quantity. The price of the face wash is affordable as compared to the quantity. It contains 100% natural ingredients and is free of parabens and sulphates. The formula lathers easily and soothes skin inflammation. The packaging is quite convenient and the quantity is good for the price. The size options make it easier to try the face wash at an affordable price. The formula stings a bit during the first few uses because of the tea tree oil. The fragrance of the formula is a bit strong according to some users. The ingredients used in this face wash are 100% natural and work well for oily and combination skin by cleansing the face and removing excess oil. It prevents breakouts and makes the skin soft and radiant. Suitable for providing a relief from rosacea, the Aleavia organic face wash contains aloe vera extracts, coconut oil, and sea kelp extracts to clean the skin thoroughly. The formula not only soothes itchy skin but also provides anti-aging benefits. It uses dead sea salt to gently exfoliate the skin while cleansing to reveal a fairer and brighter skin. It does not lather much but absorbs excess oil and dirt easily to clean the skin thoroughly. The fragrance is a bit strong as compared to other formulas. It comes in a standard bottle packaging and has a moderate price. It provides instant relief from itching and inflammation with its calming formula. Coconut oil and sea salt gently moisturize and exfoliate the skin. It does not contain any artificial ingredients or fragrances. Regular use helps to prevent signs of premature aging and dullness. The formula does not lather that well as compared to other face washes. It has a strong scent which might not suit all users. This face wash works well on very dry skin and has a soothing formula that does not irritate the skin. It contains natural ingredients and the quantity is good for the reasonable price. Made with cucumber extracts and aloe vera, the Sapo natural face cleanser gently cleanses the skin and removes dirt and bacteria. It also contains jojoba seed oil, coconut oil, cocoa butter, and vitamin E. The face wash comes in a pump packaging and has anti-aging benefits as well. It has a soothing cucumber scent and works well for sensitive skin also. The formula leaves the skin feeling soft and smooth and lathers easily. The price of the face wash is a bit high but the quantity makes it worth the price. Natural cucumber extracts and aloe vera feel light on the skin and cleanse it effectively. The scent of the face wash is not overpowering and soothes the skin. The formula can be used for all skin types and lathers very well. The natural oils used in the formula moisturize the skin and clean the pores. The face wash does not remove excess oil in one wash if used on very oily skin. It takes some time to show effective results as the formula is very mild. Cucumber is rich in antioxidants and has moisturizing properties that help the skin remain soft and smooth. This is a very mild face wash that suits all skin types and helps repair and cleanses the skin effectively. 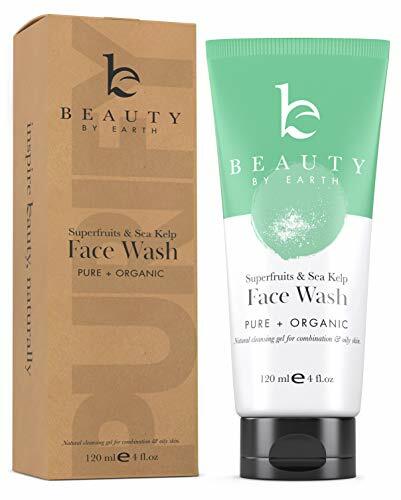 Suitable for oily and combination skin types, the Beauty by Earth face wash is made using fruits and sea kelp extracts which absorb the excess oil and keep the pores clean. It is available in two size options and comes in a tube packaging. The formula contains aloe vera, cranberry extracts, pomegranate extracts, olive extracts, rosehip seed extracts, and green tea extracts. It is rich in antioxidants and helps in the skin renewal process as well. The face wash has a fresh fragrance that is refreshing on the skin. The price of the face wash is a bit high. Organic fruit extracts provide a boost of antioxidants to the skin. The face wash absorbs excess oil effectively without drying out the skin. The fragrance is very refreshing and does not cause any breakouts. The packaging of the face wash is convenient and travel-friendly. The price of the face wash is higher than other organic face washes. It can cause a tingling sensation if used on a sensitive skin. Natural fruit extracts work very well for detoxifying the skin and improving the overall texture. They nourish and hydrate the skin while removing impurities from the pores to keep them unclogged. Charcoal is known to draw out impurities from the skin and this face wash uses this ingredient to keep the skin clean. It also contains clay and tea tree oil that absorb excess oil and have antibacterial properties. The tube packaging is easy to use and the formula is a bit thicker as compared to other face washes. The formula is free of parabens, artificial fragrances, and sulphates. The face wash has a mild fragrance and draws out all the toxins and grime from the pores. The price is affordable and the quantity is more than other face washes. It contains charcoal that purifies the skin and removes excess oil and dirt. Tea tree oil helps to combat acne and leaves the skin feeling refreshed. The face wash is formulated without parabens and artificial fragrances. It comes at an affordable price and offers more quantity. Charcoal can leave the skin a bit drier so you need to moisturize after using it. The formula can seem harsh on very sensitive skin since it contains tea tree oil. 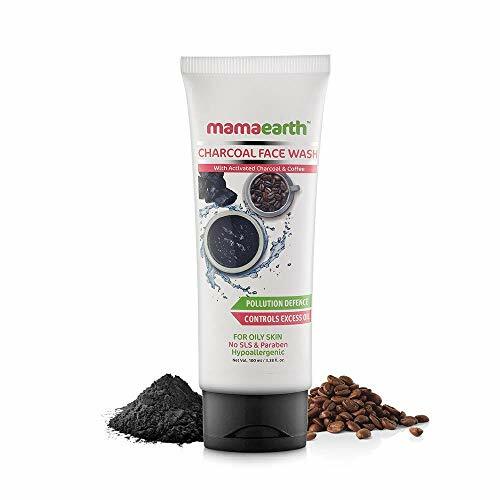 Charcoal-based skincare is becoming very popular these days and this face wash combines the power of charcoal, clay, and tea tree oil to cleanse and rejuvenate the skin. Formulated for dry skin, the Nourish Organic face wash uses watercress and cucumber extracts to wash the skin thoroughly. It also contains aloe vera for added hydration. The formula dissolves the dirt and sebum settled in the pores and leaves the skin squeaky clean after a wash. The convenient tube packaging makes the face wash travel-friendly and handy. It has a soothing cucumber extracts reduce skin inflammation and makes this face wash suitable for all skin types. The price of the face wash is affordable and you can get it at a discount online. It has a gentle formula that works well for all skin types and does not irritate the skin. Cucumber and watercress soothe the skin and remove excess oil and dirt. Aloe vera helps to combat dryness and itching and hydrates the skin. The price of the face wash is affordable and the packaging is travel-friendly. It does not remove waterproof makeup easily. The quantity of the face wash is lesser than other variants. It is a very gentle face wash that uses natural extracts of cucumber and watercress to soothe the skin and dissolve the dirt clogging the pores. The mild cleanser is suitable for all skin types including sensitive skin. If you are looking for an affordable organic face wash for dry skin, this product from Herbal Choice is a good option to consider. It comes in a pump bottle and is 100% chemical-free and preservative-free. The formula does not lather but cleanses the skin effectively. It has a rose fragrance that is a bit strong and can be used for removing makeup as well. The face wash feels light on the skin and makes the skin feel soft and smooth after a few washes. The price of the face wash is reasonable as compared to its quantity and packaging. It is suited for dry skin and contains essential oils that reduce dryness and itching. It comes in a glass packaging with a pump for ease of use. The formula is certified organic and is free of all chemicals and fragrances. The face wash works well in removing makeup as well. The strong rose scent can be a bit overpowering for some users. The face wash has a thin consistency so more quantity is required per wash. The formula is very lightweight yet hydrating enough for dry skin. The face wash is suitable for sensitive skin as well as it is completely organic and does not contain any chemicals. Some organic products are marketed as organic but contain many chemicals that defeat the whole purpose. Check the ingredients list of the face wash you are planning to buy and look for natural extracts that hydrate and clean the skin effectively without stripping away the natural oils. It is very important to consider your skin type before choosing a face wash as all formulas are different. People with sensitive skin should go for milder formulas and people with dry skin should choose a hydrating face wash. Face washes with clay and charcoal are good for oily skin. You can get a good organic face wash in around 8 $ to 20$ depending on the quantity and the formula. Organic face washes are generally a bit expensive but they are very beneficial for the skin and prevent any further damage to the skin. You can look online for deals and discounts that can help you save some money. Read the customer reviews of a particular face wash before buying it as some products do not work as well as they claim and can cause breakouts or further skin damage. These reviews will also help you determine if the face wash is suitable for your skin type and concern or not. Always remove your makeup with a proper makeup remover before using an organic face wash as it works more efficiently on clean skin. Do a patch test of the formula before applying it on the face as some organic ingredients might cause allergies and breakouts. Do not buy face washes that are very cheap as they may not contain organic ingredients and are full of chemical fillers. Look for ingredients like cucumber, aloe vera, charcoal, marine extracts, and nourishing oils in the formula as these ingredients soothe the skin and improve the complexion. Give some time to the product to show visible results as organic formulas work slowly on the skin and take more time than chemicals to show results. Avoid cleaning your eye makeup with these face washes as they contain ingredients which can cause a stinging sensation if not careful. Follow the face wash with a nourishing moisturizer to seal in the moisture as a freshly washed skin absorbs the moisturizer better. Do not switch face washes very often as this will lead to more skin concerns and will not give you the desired results. This was the detailed list of the ten most popular organic face washes that are very gentle on the skin and remove excess oil, dirt, and makeup easily. These face washes use pure and natural ingredients and are free of harmful chemicals and artificial fragrances that irritate the skin. Using them regularly will help you repair your skin and avoid the harmful effects of chemicals on your skin. Use these tips to get even more benefits out of these face washes. Have you used an organic face wash? Which one is your preferred organic face wash?